When Zien, 50, told the man he hadn’t qualified for the Boston Marathon (“BQ” for short), the man could not believe it. “Then how can you lead FTM without having run Boston?,” he asked. As the Boston Marathon grows in popularity, so does pressure to qualify for the prestigious race. The hard cut-off qualifying times have made it a bucket list goal for many competitive amateur runners. Marathon participants recognize the acronym “BQ,” and some, like Zien, are even led to believe that they aren’t “a real runner” unless they accomplish the goal. It’s become, in a sense, the end-all goal for some runners. Natalie Patterson doesn’t completely understand the obsession over Boston. For the 27-year-old sub-elite runner, the qualifying standards “mean nothing.” A 2:55 marathoner who trains with the Georgetown Running Club, Patterson is closer to qualifying for the Olympic Marathon Trials then not qualifying for Boston, but she has no desires to run one of the biggest races in the world. Patterson prefers smaller, more intimate races where her family and friends can watch her run. Over 25,000 participants finished the Boston Marathon in last year’s freezing, rain-soaked edition. She acknowledges that her opinion may not the most popular among runners. To Patterson, a runner finishing a marathon in seven hours is just as impressive as one who qualifies for Boston. “That person is putting in the same amount of time and effort,” she says. “You can still drink it!” Patterson says. But ultimately, she understands the appeal. She went to Boston last year to spectate the race. Patterson calls the atmosphere of the race “incredible,” and it reminded her of her hometown Kalamazoo Marathon in Michigan. Next Monday will be Sarah Byron’s first Boston Marathon. Ever since finishing the 2014 Baltimore Running Festival marathon in 3:55:27, she has made it her goal to BQ. The Baltimore race was her first marathon, and afterward, she kept hearing fellow runners talk about Boston. From there, Byron chipped away at her time. In 2016, she missed the Boston qualifying time by 36 seconds in Baltimore, and then ran a 3:39:05 the following year at the Delaware Marathon. She was knocking on the door. And there lies the appeal of the BQ for Byron, and why the 29-year-old who lives in Rockville has made it her singular running goal all these years. For non-elite runners like Byron, achieving a BQ can feel like ultimate reward at the end of a tunnel. It finally happened. At the 2017 Wineglass Marathon in Corning, New York, Zien ran a 3:26:56.8, a 3:04 buffer under the qualifying standard that he felt assured would get him in for Boston. He hadn’t run a personal best, but that didn’t matter. 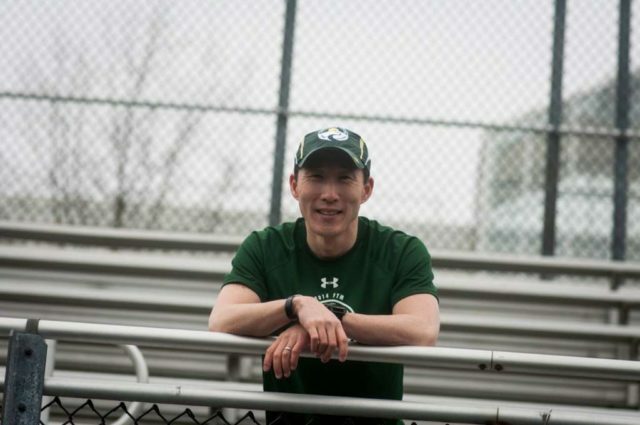 Zien could look forward to joining the tens of thousands of runners who had made the same dedication as him to get to the start line of the 2019 Boston Marathon. The ones who put in hours of grueling long runs and lactic-acid building track workouts so they could proudly wear the colorful jacket they believed they’ve finally earned. At least that’s what he thought. Because of the number of qualifiers, the accepted times ended up being 3:25:08 for Zien’s gender and age group. The journey, a dejected Zien learned, continues. Zien says he would never “in a million years” put this pressure on his runners as a coach. He doesn’t want to project his goals onto others, just like he wouldn’t want other runners to speak for him. On April 27, just a few weeks after the Boston Marathon this year, Zien will be in Las Vegas for the Revel Mt. Charleston Marathon known for its fast, downhill course. He’s entering the race in good spirits. He feels good about his training, his fitness, and most importantly, his chances of qualifying for Boston. He’s a runner, and no matter what happens, no one can take that away.